Heat the milk in a separate pan until just about to boil. Have it ready and keep hot. In a medium saucepan, heat the butter over medium-low heat until melted. Add the flour and stir until smooth. 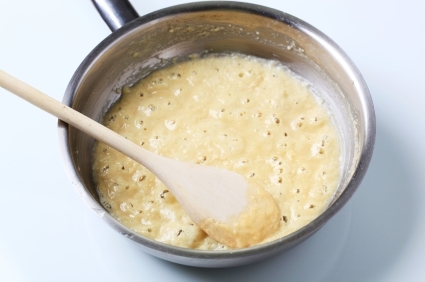 Over medium heat, cook until the mixture turns a light, golden color, about 3-4 minutes, stirring with a whisk. Add the hot milk to the butter mixture 1 cup at a time, whisking continuously until very smooth. Bring to a boil. Cook 10 minutes, stirring constantly, then remove from heat. Season with salt and nutmeg, and set aside until ready to use.